Wall stickers - the new craze now. Couldn't stop myself from buying wall stickers every week for the past few weeks. I bought most of them from Groupon. A small humble tour around my hut, if you don't mind. 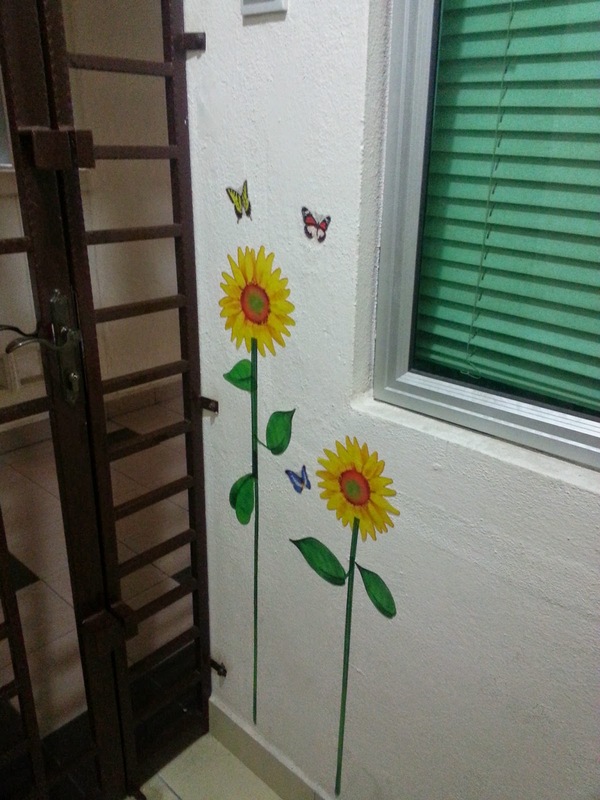 Here's the sunflower wall sticker at the entrance of my hut. 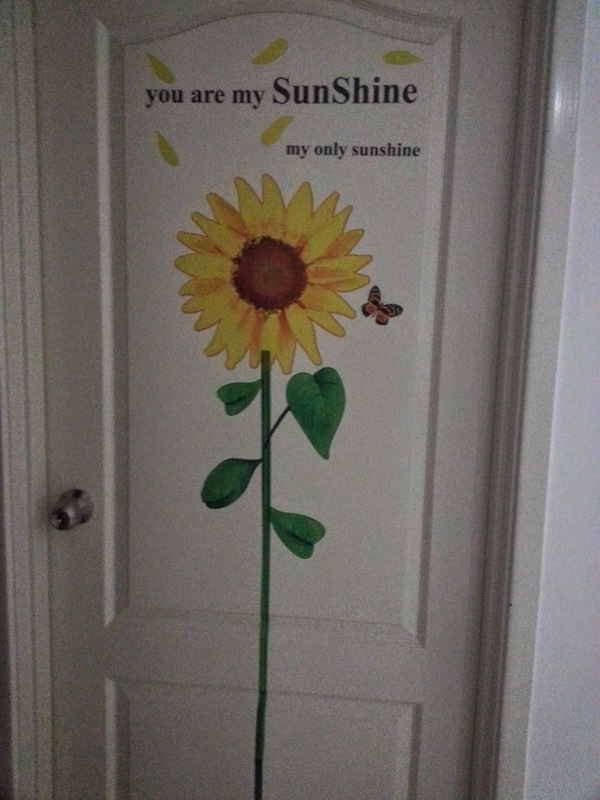 There are four sunflowers on one wall sticker. So I used two flowers for the entrance, one here, at hubby's study room's door. And the last one for the wardrobe room door. We call this the "hang clothes" (long sam) room coz we live in a condo, there's no garden to hang clothes, thus, we hang our clothes in this room. Oooo, can you see some flowers and butterflies too? Next, the bird house sticker. Again, these four bird houses and trees and birds come in one piece, but I cut and separated them so that I could use them on 3 doors. One for the masterbedroom door, one for the kids' room door and one for the toilet door. Closeup on these very sweet lovely thing. Lastly, here's the wall at the living room. The TV is located on the right after this wall. This wall is facing the living room main window. so we have some chirping birds, crawling beetles and grasses too. Morning, Louiz! Eh, very nice lah! I love it! It's an easy way to brighten up the house/condo, hor? I should consider this for my house too to jazz it up. I wonder how long the sticker can last and if it would stain/peel the wall paint if I removed it later. Morning babeh! If you apply only once, it would stay strong.. Good quality one.. But (if like me), itchy hands, stick here, then ooops, sorry, wana change location, take out, stick again, then it's not very strong already.. And nope, if you take it out even after a few months, the wall paint won't come out also wor.. Really.. Very nice. I wonder where I can get these...stick on the walls in my girl's quarters. Sure will help brighten up the place a lot. 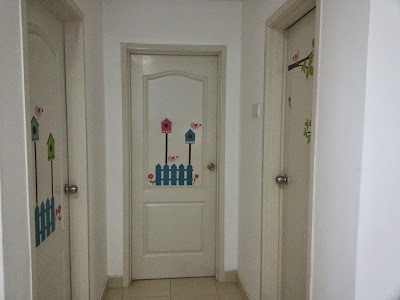 I got it from Groupon.. RM28 per piece, more than enough to stick on 3 doors, or a feature wall in my condo (coz my house is small ma, bigger house, errr, maybe you need more, but there are sizes and dimensions la).. Go to Groupon, search for Wall Stickers, you'll go crazy, serious! Ya ya ya, quality not bad too, as long as don't itchy hands stick liao then take off many times lor.. Very nice ! I remember my sis also crazy about these stickers last year at this time. Aaa-hah! Means I'm not the only one.. Haha.. I wonder if they sell Transformers stickers, I might get those instead :D .. But then, mine rumah sewa, better don't stick anything lah..
Nope, no Transformers stickers, haha.. They have stuffs like flowers la, trees la, birds la, cage la, Paris night view la, those sorts..
nice wor....u transform the house to be a "lil' garden on the wall" with sunflower, grass, birds etc. I like it! 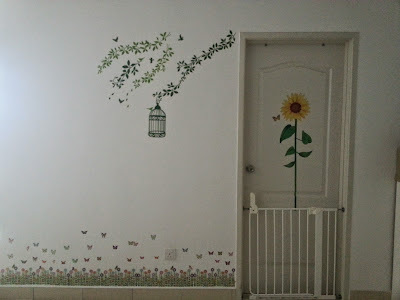 Actually, I don't like garden theme, with butterflies and beetles and all, but they come together in one package, so, no choice lor, hehe..
You can stick in your room now ma.. They add colours to the room, good quality too..
You really turned your happy house into a nice fairyland with interesting plants & blooms everywhere! I like your idea and you are so creative in real person. Before these stickers were invented or rather came to our country, I personally painted the doors of my condo with many birds for good feng shui. I think I blogged about it once but forgotten which post. Oh really? Doors painted with birds for good feng shui? 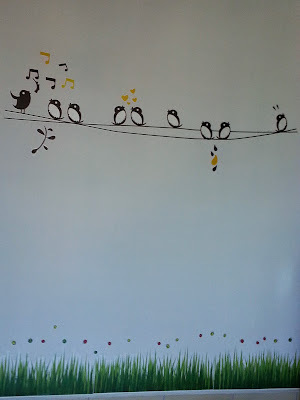 I'd better take note..
Ok, now I go read it..
today's post is about wall sticker ah?? eih, I thot this one existed long time ago?? or maybe it's now your in-thing only?? actually I also bought one from Mr DIY for my new office but then bought already just left there nobody wants (or dares) to do it lor, scared later stick till not nice ah, actually quite tension also leh.. hahaha!! You can just stick at your own work station lor if other people dare not stick, hehe..
Wah, you usually spam in the LRT? I cannot wor.. Head dizzy one la.. And keep on pressing handphone while being sardine-ed up, can meh? I like the last one the most, can imagine that early in the morning eating breakfast and look at the birds, like listen to the birds singing!! The last one is at the living room, next to the TV, so I can see them everyday, haha..
Hello Princess, thank you for giving us a tour of your place. 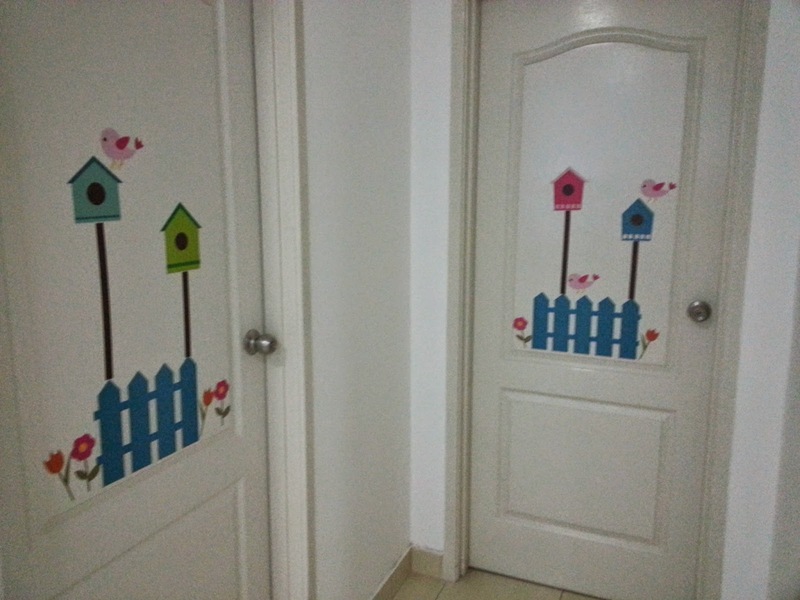 I love how you decorated your house with stickers - so bright and lively! Your place is big with so many rooms. hahahaa... Looks like a Garden house!! Not bad.. can hear the birds chirping each morning, right? :) Brightens up your day! If got depression ahh, nomatter how cheerful also it won't brighten my day.. Eh, why am I talking about depression pulak, hehe.. I can see your house must be a cheerful house with bright and sunny sunflowers and singing birds... but I believe that your house is never fully cheerful without you! I reckon that you are the ultimate cheerful factor in your family and house!!! I think the kids make the house more "loud" and cheerful.. I have to admit I used to be a cheerful person, but after having kids, I have to become more serious, haha.. It is nice. 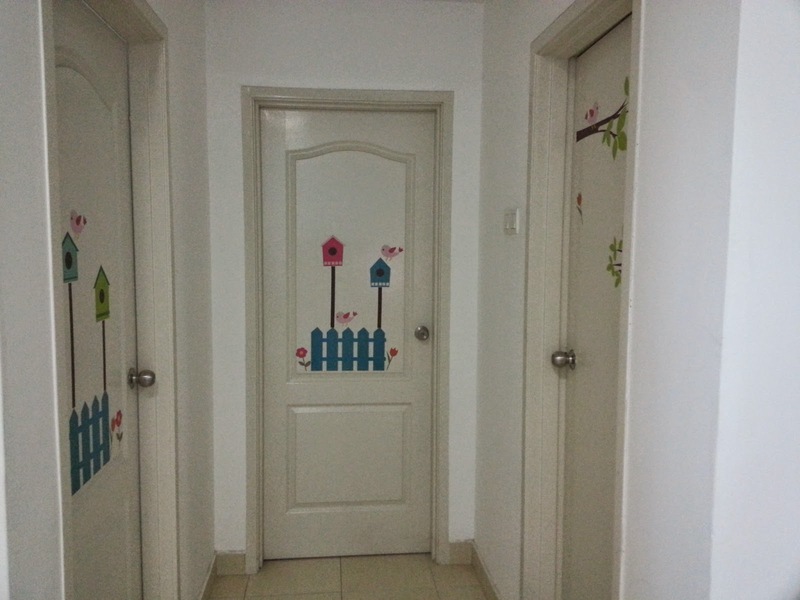 I like it paste on each door. I always want wall papers for my room but not cheap. 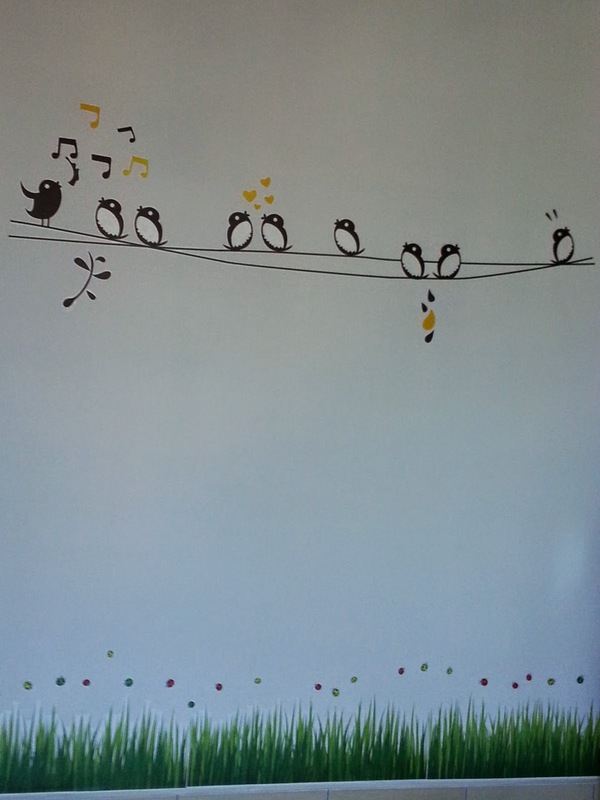 It beautified the wall. 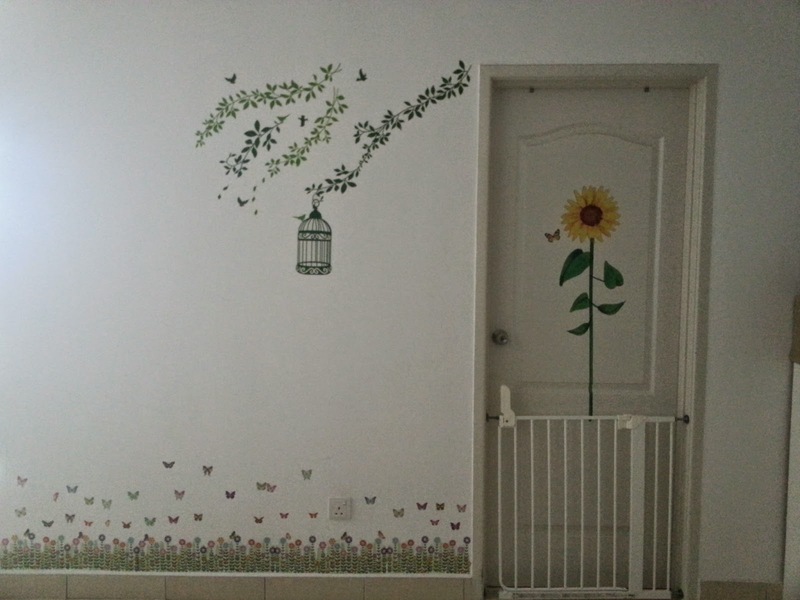 Wall papars are not cheap, but wall stickers are ok.. RM28 per piece only, which I bought from Groupon..
Ah, sunflowers, my fav flower! I was fascinated by one I saw at MPH a few days ago. Do they leave a mark when you peel them off? That's my concern. I like the bottom sticker of flowers/grass and butterflies in picture #3. So sweet. These stickers sure do brighten up a room. Kudos! No marks and the wall paint won't come off.. Really..